Introduction: Renal cell carcinoma (RCC) represents 2%–3% of all cancers in adults, and its pathogenesis is mainly related to altered cellular response to hypoxia. Lenvatinib, a novel multitarget tyrosine kinase inhibitor (TKI), represents a therapeutic option, in combination with mammalian target of rapamycin (mTOR) inhibitor everolimus, for the treatment of metastatic RCC (mRCC). Aim: The objective of this article is to review the evidence about the treatment of mRCC with combination of lenvatinib plus everolimus. Evidence review: Phase I studies supported clinical activity of lenvatinib in mRCC. A randomized, Phase II, open-label, multicenter trial demonstrated the clinical efficacy of combination treatment with lenvatinib plus everolimus in patients with progressive mRCC after prior therapy with TKI. Median progression-free survival was improved by 9 months with the combination therapy compared to the single-agent everolimus, with an overall response rate of 43% for the experimental regimen. Lenvatinib plus everolimus appeared to be slightly less toxic than single-agent lenvatinib and more toxic than single-agent everolimus; grade 3–4 adverse events occurred in 71% of patients. Currently, lenvatinib plus everolimus has US Food and Drug Administration approval for its use in mRCC after failure of previous treatment with TKI. Conclusion: The combination therapy with lenvatinib plus everolimus might be a promising choice for second-line treatment of mRCC patients. Based on the results of the Phase II trial, it is possible to speculate that the combination therapy could be appropriate for patients with high disease burden or strongly symptomatic patients. Lenvatinib (E7080, Lenvima®; Eisai, Hatfield, UK) is a multitarget kinase inhibitor firstly approved by US Food and Drug Administration (FDA) and European Medicine Agency (EMA) as monotherapy for the treatment of locally recurrent or metastatic, progressive, radioactive iodine-refractory differentiated thyroid cancer, and more recently approved by FDA, in combination with everolimus, for the treatment of advanced RCC following one prior antiangiogenic therapy. This review discusses the mechanism of action, pharmacokinetics, clinical efficacy, and tolerability of lenvatinib in combination with everolimus for the treatment of advanced RCC. The second critical pathway involved in the development and growth of RCC is regulated by mTOR protein. The mTOR signaling pathway is known to be responsible for anchorage-independent cellular expansion, increased proliferative potential and evasion from apoptosis, and increased cell motility and metastasis.17 Moreover, the activation of mTOR induced by overexpressed growth factors (ie, VEGF and PDGF) promotes HIF expression,18,19 triggering a positive feedback loop between VHL/HIF and mTOR signaling.20 It is evident that the two pathways are closely connected and cross-talking, hence the attempt of combining both TKI and the mTOR inhibitors for the treatment of mRCC. Lenvatinib is a novel potent multitarget TKI that performs its action through the inhibition of VEGFR-1, VEGFR-2, VEGFR-3, PDGFR-β, RET, c-KIT, and fibroblast growth factor receptors (FGFR) 1–4, the latter deemed as responsible for resistance to VEGF inhibitors in RCC.24,25 Preclinical data on the effect of the combination of lenvatinib with everolimus have been reported. Matsumi et al investigated the mechanisms of these drugs used in combination in human RCC xenograft mouse models: everolimus demonstrated antiproliferative effects, whereas lenvatinib showed antiangiogenic properties. In this study, tumor angiogenesis was evaluated by microvessel density (MVD) of the tumor; whereas lenvatinib monotherapy consistently reduces MVD in A-498 xenografts, everolimus monotherapy did not. In the same xenograft model, enhanced antitumor activity resulted from the combination of the two drugs, suggesting the synergistic effect of the two different mechanisms of action. Figure 1 Mechanisms of action of lenvatinib and everolimus. Notes: Lenvatinib inhibits RTKs on endothelial cell and cancer cell. Activated VEGFR and FGFR on endothelial cell trigger the MAPK/ERK pathway that promotes angiogenesis. On cancer cell, activated RTKs (ie, VEGFR, PDGFR-β, RET, c-KIT, and FGFR) mediate cell proliferation through the MAPK/ERK pathway; the activation of PI3K/AKT/mTOR pathway leads to cell survival, growth, and motility. Everolimus inhibits mTOR signaling. HIF is degraded by VHL in normoxic condition; in the presence of hypoxia, or when overexpressed, it promotes angiogenesis through the synthesis of growth factors. Dashed arrows indicate crosslinks between different signaling pathways: RAS activates PI3K, whereas mTOR promotes HIF expression. Abbreviations: VEGF, vascular endothelial growth factor; PDGF, platelet-derived growth factor; TGF-β, transforming growth factor beta; VEGFR, vascular endothelial growth factor receptor; PDGFR, platelet-derived growth factor receptor; FGFR, fibroblast growth factor receptor; RTK, receptor tyrosine kinase; MAPK, mitogen-activated protein kinase; ERK, extracellular signal regulated kinase; PI3K, phosphoinositide 3-kinase; mTOR, mammalian target of rapamycin; HIF, hypoxia-inducible factor; VHL, von Hippel–Lindau; PDK, pyruvate dehydrogenase kinase; RAS, rat sarcoma; RAF, rapidly accelerated fibrosarcoma; MEK, mitogen-activated protein extracellular signal-regulated kinase kinase; ERK, extracellular signal-regulated kinase; PIP, phosphatidylinositol phosphate; AKT, protein kinase B kinase (AKT8 virus oncogene cellular homolog). A strong rationale to combine two molecules with different mechanism of action (Figure 1), the good tolerability profile of everolimus in mRCC patients and the availability of preclinical data that showed the synergistic antitumor effect of these two drugs, all together are elements that justify the choice to further develop the combination of everolimus (instead of other agents) with lenvatinib in the clinical setting. 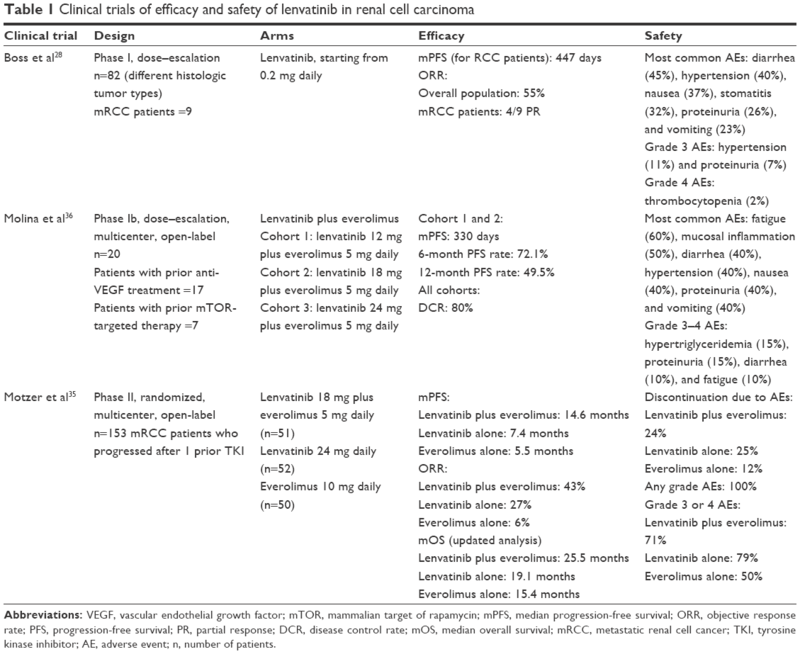 Clinical trials of efficacy and safety of lenvatinib alone or in combination with everolimus in advanced RCC are shown in Table 1. Abbreviations: VEGF, vascular endothelial growth factor; mTOR, mammalian target of rapamycin; mPFS, median progression-free survival; ORR, objective response rate; PFS, progression-free survival; PR, partial response; DCR, disease control rate; mOS, median overall survival; mRCC, metastatic renal cell cancer; TKI, tyrosine kinase inhibitor; AE, adverse event; n, number of patients. Consequent to the encouraging results of Phase I studies, a randomized, Phase II, open-label, multicenter trial by Motzer et al explored efficacy and safety of second-line treatment with lenvatinib alone or in combination with everolimus, compared to single-agent everolimus in the setting of mRCC. PFS was the primary endpoint, while toxicity, objective RR, and OS were secondary endpoints. One hundred and fifty-three patients with advanced ccRCC who progressed after one prior VEGF-targeted therapy were randomized 1:1:1 to receive single-agent lenvatinib (24 mg daily), single-agent everolimus (10 mg daily), or the combination (lenvatinib 18 mg plus everolimus 5 mg daily) in 28-day continuous cycles. Median treatment duration was 7.6 months for patients receiving the combination of both drugs, 7.4 months for those allocated to single-agent lenvatinib, and 4.1 months for those included in the single-agent everolimus arm. Overall response rate (ORR) was 43% for patients receiving the combination therapy, compared to 6% for patients treated with everolimus alone (rate ratio 7.2; 95% CI 2.3−22.5; P<0.0001); ORR was 27% for the single-agent lenvatinib arm, but data compared to those of the combination arm were not statistically significant (rate ratio 1.6; 95% CI 0.9−2.8; P=0.10). Conversely, the difference in terms of ORR between single-agent lenvatinib and single-agent everolimus was relevant and significant (rate ratio 4.5; 95% CI 1.4−14.7; P=0.0067). Increase in median OS (mOS) for the combination arm was not significant at a primary data cutoff of the study, whereas the post hoc updated analysis showed an mOS of 25.5 months for lenvatinib plus everolimus, of 19.1 months for single-agent lenvatinib, and of 15.4 months for single-agent everolimus. In this updated analysis, the increase of mOS for the combination arm compared to single-agent everolimus was statistically significant (25.5 vs 15.4 months; HR: 0.51, 95% CI 0.30−0.88; P=0.024). Nevertheless, mOS did not statistically differ between the single-agent lenvatinib arm and everolimus alone arm (19.1 vs 15.4 months; HR: 0.68; 95% CI 0.41−1.14; P=0.12) or combination arm (25.5 vs 19.1 months; HR: 0.75, 95% CI 0.43−1.30; P=0.32). In all, 71% of patients receiving lenvatinib plus everolimus and 62% of those assigned to lenvatinib alone required a lenvatinib dose reduction due to AEs. No unexpected drug toxicities were reported. The most frequently reported events were consistent with the class-specific AEs of the two molecules; treatment discontinuation due to AEs was observed in 24% of patients allocated to the lenvatinib plus everolimus arm, 25% of patients who received lenvatinib, and 12% of patients assigned to everolimus. Grade 3–4 AEs occurred in 71% of patients receiving the combination, 79% for single-agent lenvatinib, and 50% for single-agent everolimus. Among these, the most common were diarrhea, fatigue, and hypertension for the first treatment arm; proteinuria, hypertension, and diarrhea for the second one; anemia, dyspnea, hypertriglyceridemia, and hyperglycemia for the third one. Only one case of fatal drug-related AE (cerebral hemorrhage) was reported in the combination treatment arm; in the single-agent lenvatinib arm, one of three deaths due to AEs was supposed to be drug-related (myocardial infarction); no death in the single-agent everolimus arm was considered to be treatment-related. In Phase I and Phase II trials, lenvatinib has shown significant antitumor activity in mRCC, and the combination of lenvatinib plus everolimus seems to be more effective than single-agent therapy. Lenvatinib is the only TKI which showed promising and relevant preclinical and clinical efficacy in combination with an mTOR inhibitor for the treatment of mRCC, with an acceptable toxicity profile. Indeed, this cited trial currently represents the first and only controlled study with a direct comparison between the treatment sequence “TKI-mTOR inhibitor” and a “TKI-TKI strategy”, the latter coming out as the winner. Recently, the anti-PD-1 antibody nivolumab was approved by FDA and EMA for the treatment of mRCC in second-line setting. The pivotal trial CheckMate-025 showed an mOS improvement for patients who received nivolumab compared to those treated with everolimus (25.0 vs 19.6 months; HR: 0.75, 98.5% CI 0.57−0.93; P=0.002) with no significant difference in terms of mPFS (4.6 months for nivolumab vs 4.4 months for everolimus; HR: 0.88, 95% CI 0.75−1.03; P=0.11). This interesting finding has aroused hopes and has opened a new landscape for the treatment of mRCC, but on the other hand risking to obscure the value of a proven targeted therapy strategy, valuable at least for that fraction of patients primary refractory to immunotherapy (35% in CheckMate-025 study).12 One of the next challenges will be identification of adequate predictive factors that could help the clinician to choose the best therapy/strategy (ie, TKI-TKI-nivolumab sequence vs TKI-nivolumab-TKI sequence vs TKI-TKI-TKI/mTOR inhibitor sequence vs TKI-TKI+mTOR-nivolumab sequence) for each patient. Until then, the high ORR obtained with lenvatinib plus everolimus combination (43%) could suggest that patients with high disease burden or strongly symptomatic patients may be those most likely to benefit from this option. The combination therapy with lenvatinib plus everolimus is a promising choice for the treatment of mRCC patients who progress after first-line TKI treatment. It has been approved by the US FDA in this setting. Currently, use of either nivolumab or cabozantinib represents the new standard treatment in second-line setting; axitinib, everolimus, and sorafenib are still alternative options for selected patients. Despite a not-negligible toxicity, lenvatinib plus everolimus showed improvement in PFS and high ORR; based on these findings, the combination therapy could be appropriate for patients with high disease burden or strongly symptomatic patients. Eventually, a Phase III study is needed to validate the encouraging results of the Phase II trial. Ljungberg B, Albiges L, Bensalah K, et al. European Association of Urology guidelines on renal cell carcinoma; 2017. Available from: http://uroweb.org/guideline/renal-cell-carcinoma. Accessed April 20, 2017. Escudier B, Porta C, Schmidinger M, et al. Renal cell carcinoma: ESMO clinical practice guidelines for diagnosis, treatment and follow-up. Ann Oncol. 2014;25(Suppl 3):49–56. Lam JS, Leppert JT, Belldegrun AS, Figlin RA. Novel approaches in the therapy of metastatic renal cell carcinoma. World J Urol. 2005;23(3):202–212. Choueiri TK, Motzer RJ. Systemic therapy for metastatic renal-cell carcinoma. N Engl J Med. 2017;376(4):354–366. Buti S, Leonetti A, Dallatomasina A, Bersanelli M. Everolimus in the management of metastatic renal cell carcinoma: an evidence-based review of its place in therapy. Core Evid. 2016;11:23–36. Mendel DB, Laird AD, Xin X, et al. In vivo antitumor activity of SU11248, a novel tyrosine kinase inhibitor targeting vascular endothelial growth factor and platelet-derived growth factor receptors: determination of a pharmacokinetic/pharmacodynamic relationship. Clin Cancer Res. 2003;9(1):327–337. Sloan B, Scheinfeld NS. Pazopanib, a VEGF receptor tyrosine kinase inhibitor for cancer therapy. Curr Opin Investig Drugs. 2008;9(12):1324–1335. Wilhelm SM, Carter C, Tang L, et al. BAY 43-9006 exhibits broad spectrum oral antitumor activity and targets the RAF/MEK/ERK pathway and receptor tyrosine kinases involved in tumor progression and angiogenesis. Cancer Res. 2004;64(19):7099–7109. Choueiri TK, Escudier BJ, Powles T, et al. Cabozantinib versus everolimus in advanced renal cell carcinoma (METEOR): final results from a randomised, open-label, phase 3 trial. Lancet Oncol. 2016;17(7):917–927. Motzer RJ, Escudier B, McDermott DF, et al; CheckMate 025 Investigators. Nivolumab versus everolimus in advanced renal-cell carcinoma. N Engl J Med. 2015;373(19):1803–1813. NCCN clinical practice guidelines in oncology: kidney cancer (version 2.2017). Available from: https://www.nccn.org/professionals/physician_gls/pdf/kidney.pdf. Accessed May 20, 2017. Banumathy G, Cairns P. Signaling pathways in renal cell carcinoma. Cancer Biol Ther. 2010;10(7):658–664. Hickey MM, Simon MC. Regulation of angiogenesis by hypoxia and hypoxia-inducible factors. Curr Top Dev Biol. 2006;76:217–257. Gudas LJ, Fu L, Minton DR, Mongan NP, Nanus DM. The role of HIF1α in renal cell carcinoma tumorigenesis. J Mol Med (Berl). 2014;92(8):825–836. Katso R, Okkenhaug K, Ahmadi K, White S, Timms J, Waterfield MD. Cellular function of phosphoinositide 3-kinases: implications for development, immunity, homeostasis, and cancer. Annu Rev Cell Dev Biol. 2001;17:615–675. Bernardi R, Guernah I, Jin D, et al. PML inhibits HIF-1α translation and neoangiogenesis through repression of mTOR. Nature. 2006;442(7104):779–785. Toschi A, Lee E, Gadir N, Ohh M, Foster DA. Differential dependence of hypoxia-inducible factors 1α and 2α on mTORC1 and mTORC2. J Biol Chem. 2008;283(50):34495–34499. Guo H, German P, Bai S, et al. 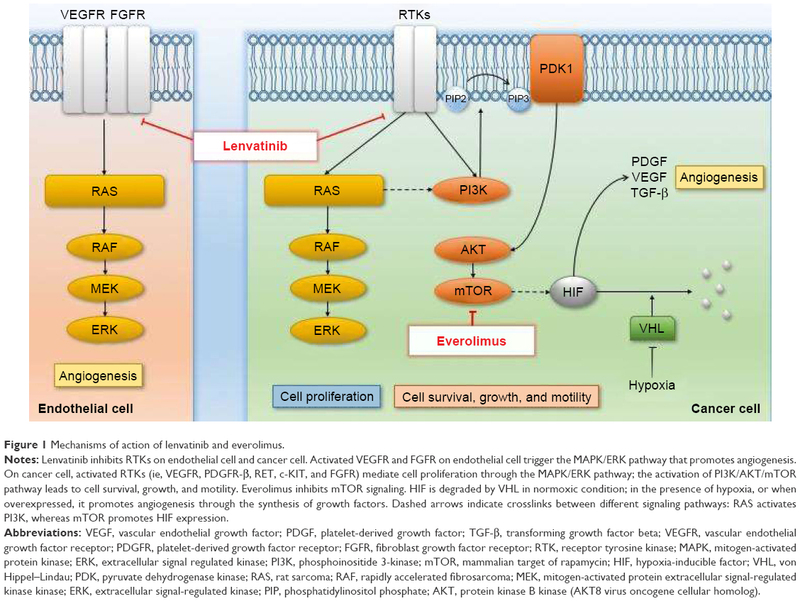 The PI3K/AKT pathway and renal cell carcinoma. J Genet Genomics. 2015;42(7):343–353. Ravaud A, Barrios CH, Alekseev B, et al. RECORD-2: phase II randomized study of everolimus and bevacizumab versus interferon α-2a and bevacizumab as first-line therapy in patients with metastatic renal cell carcinoma. Ann Oncol. 2015;26(7):1378–1384. Flaherty KT, Manola JB, Pins M, et al. BEST: a randomized phase II study of vascular endothelial growth factor, RAF kinase, and mammalian target of rapamycin combination targeted therapy with bevacizumab, sorafenib, and temsirolimus in advanced renal cell carcinoma – a trial of the ECOG-ACRIN Cancer Research Group (E2804). J Clin Oncol. 2015;33(21):2384–2391. Rini B, Bellmunt J, Clancy J, et al. Randomized phase III trial of temsirolimus and bevacizumab versus interferon alfa and bevacizumab in metastatic renal cell carcinoma: INTORACT trial. J Clin Oncol. 2014;32(8):752–759. Okamoto K, Kodama K, Takase K, et al. Antitumor activities of the targeted multi-tyrosine kinase inhibitor lenvatinib (E7080) against RET gene fusion-driven tumor models. Cancer Lett. 2013;340(1):97–103. Sonpavde G, Willey CD, Sudarshan S. Fibroblast growth factor receptors as therapeutic targets in clear-cell renal cell carcinoma. Expert Opin Investig Drugs. 2014;23(3):305–315. Matsuki M, Adachi Y, Ozawa Y, et al. Targeting of tumor growth and angiogenesis underlies the enhanced antitumor activity of lenvatinib in combination with everolimus. Cancer Sci. 2017;108(4):763–771. Yamada K, Yamamoto N, Yamada Y, et al. Phase I dose–escalation study and biomarker analysis of E7080 in patients with advanced solid tumors. Clin Cancer Res. 2011;17(8):2528–2537. Boss DS, Glen H, Beijnen JH, et al. A phase I study of E7080, a multitargeted tyrosine kinase inhibitor, in patients with advanced solid tumours. Br J Cancer. 2012;106(10):1598–1604. Gupta A, Jarzab B, Capdevila J, Shumaker R, Hussein Z. Population pharmacokinetic analysis of lenvatinib in healthy subjects and patients with cancer. Br J Clin Pharmacol. 2016;81(6):1124–1133. Dubbelman AC, Rosing H, Nijenhuis C, et al. Pharmacokinetics and excretion of (14)C-lenvatinib in patients with advanced solid tumors or lymphomas. Invest New Drugs. 2015;33(1):233–240. Hussein Z, Mizuo H, Hayato S, Namiki M, Shumaker R. Clinical pharmacokinetic and pharmacodynamic profile of lenvatinib, an orally active, small-molecule, multitargeted tyrosine kinase inhibitor. Eur J Drug Metab Pharmacokinet. Epub 2017 Feb 24. Shumaker RC, Aluri J, Fan J, Martinez G, Thompson GA, Ren M. Effect of rifampicin on the pharmacokinetics of lenvatinib in healthy adults. Clin Drug Investig. 2014;34(9):651–659. Shumaker R, Aluri J, Fan J, Martinez G, Thompson GA, Ren M. Effects of ketoconazole on the pharmacokinetics of lenvatinib (E7080) in healthy participants. Clin Pharmacol Drug Dev. 2015;4(2):155–160. Shumaker R, Aluri J, Fan J, Martinez G, Pentikis H, Ren M. Influence of hepatic impairment on lenvatinib pharmacokinetics following single-dose oral administration. J Clin Pharmacol. 2015;55(3):317–327. Motzer RJ, Hutson TE, Glen H, et al. Lenvatinib, everolimus, and the combination in patients with metastatic renal cell carcinoma: a randomized, phase 2, open-label, multicenter trial. Lancet Oncol. 2015;16:1473–1482. Molina AM, Hutson TE, Larkin J, et al. A phase 1b clinical trial of the multi-targeted tyrosine kinase inhibitor lenvatinib (E7080) in combination with everolimus for treatment of metastatic renal cell carcinoma (RCC). Cancer Chemother Pharmacol. 2014;73(1):181–189. Motzer RJ, Hutson TE, Ren M, Dutcus C, Larkin J. Independent assessment of lenvatinib plus everolimus in patients with metastatic renal cell carcinoma. Lancet Oncol. 2016;17(1):e4–e5. EISAI. Eisai submits new application in Europe for in-house developed anticancer agent lenvatinib seeking approval for indication covering renal cell carcinoma. Available from: www.eisai.com/news/news201602.html. Accessed April 20, 2017. Buti S, Bersanelli M. Combination therapy in kidney cancer: the next revolution? Lancet Oncol. 2015;16(15):1441–1442. Eisai Inc. Lenvatinib/Everolimus or Lenvatinib/Pembrolizumab Versus Sunitinib Alone as Treatment of Advanced Renal Cell Carcinoma. Available from: https://clinicaltrials.gov/ct2/show/NCT02811861. NLM identifier: NCT02811861. Accessed April 20, 2017. Eisai Inc. A Phase 2 Trial to Evaluate Efficacy and Safety of Lenvatinib in Combination With Everolimus in Subjects With Unresectable Advanced or Metastatic Non Clear Cell Renal Cell Carcinoma (nccRCC) Who Have Not Received Any Chemotherapy for Advanced Disease. Available from: https://clinicaltrials.gov/ct2/show/NCT02915783. NLM identifier: NCT02915783. Accessed April 20, 2017.